Holyland gifts offer Christmas ornaments specially made in Bethlehem. These ornaments are nativity ornaments shipped directly from the USA. These Christmas ornaments depict the nativity scene with a shape like a house and other like a teardrop. Olive wood ornaments are made from Holy Land olive wood in Bethlehem exactly near the birthplace of the Lord Jesus. These wood ornaments make wonderful small inexpensive Christmas gift for anyone. You might love to see some of the best 3D wood art purely handmade. A beautiful gift for your loving one. These exclusive 3D ornaments are hand carved in Bethlehem and can be easily hung with golden strings and also has an explanation cards. The true rich colors and interesting vines are some of the amazing characteristics of the famous Bethlehem Olive Wood. 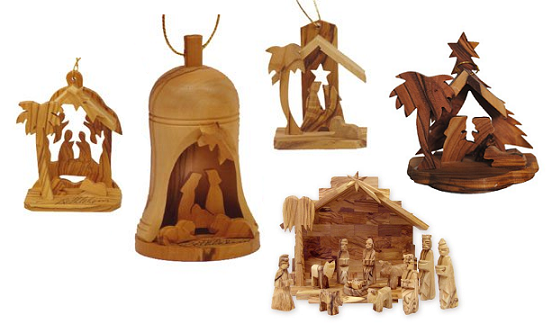 A set of most popular 3-dimensional ornaments which includes Bethlehem bell, Angel house nativity and star Nativity ornament superbly carved in Bethlehem, the Holy Land. These intricate designs are carved using a scroll saw. It's a perfect Ornament party gift and will surely add decor to your Christmas tree.